Oh what an experience this was. I turned into his um, kitchen workhorse. He had never measured out his ingredients before so I was writing and the man who HATES to have his photo taken, suddenly went into supermodel mode and wanted to pose for pictures of every step. I would have been annoyed at his demands had I not been laughing so hard pretending to have to take second and third photos just to get him to stand in his "pose" a little longer. Since this will be a blog, full of photos, let me get started on the instructions. This recipe is HUGE. We make an aluminum turkey roaster pan and a 9x13 pan. We like lots of leftovers since we only make this once or twice a year. When you marvel in awe or disgust at the ingredients, remember this is a ONCE in awhile treat, nothing we eat regularly, so no comments, you got it? I will list the ingredients you need in a list. The ingredients will most likely need to be divided among the different parts of the lasagna. This is just a master list.....and boy is it a master list alright! Boil noodles. Drizzle them with oil and lay out in a single layer, cover with foil and lay more on top, etc. Preheat oven to 350 degrees. Make sure to break it into very small bits. You don't want large chunks of meat in your sauce. Well YOU might but not mine! 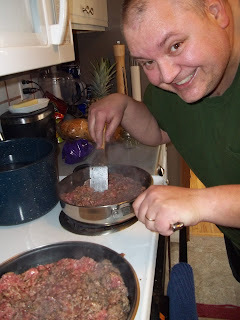 Drain ground meat but DO NOT RINSE, you will rinse off all of the flavorings!! Pour into your already simmering sauce. Your spoon should stand up in it, that is when you know it is perfect! Simmer sauce for as long as you can on a medium low temperate. Be sure to stir often as the sugar will burn on the bottom. Try to let simmer up to 2 hours. This sauce simmered for 2 hours. Showing off his um....2 handed egg whisking skills. Put larger pan on a cookie sheet for stability. The large one will take 1hr-1.5 hrs in the oven. Keep covered until the last 20 minutes. The small one will take 30-45 minutes, keep covered until the last 15 minutes. After removing from the oven, let sit 10-15 minutes before cutting! Only missing its top layer of cheese! Here he is in his sprinkling glory. We had a great afternoon cooking. Nothing can replace simple time together, laughing, singing, and laughing some more! 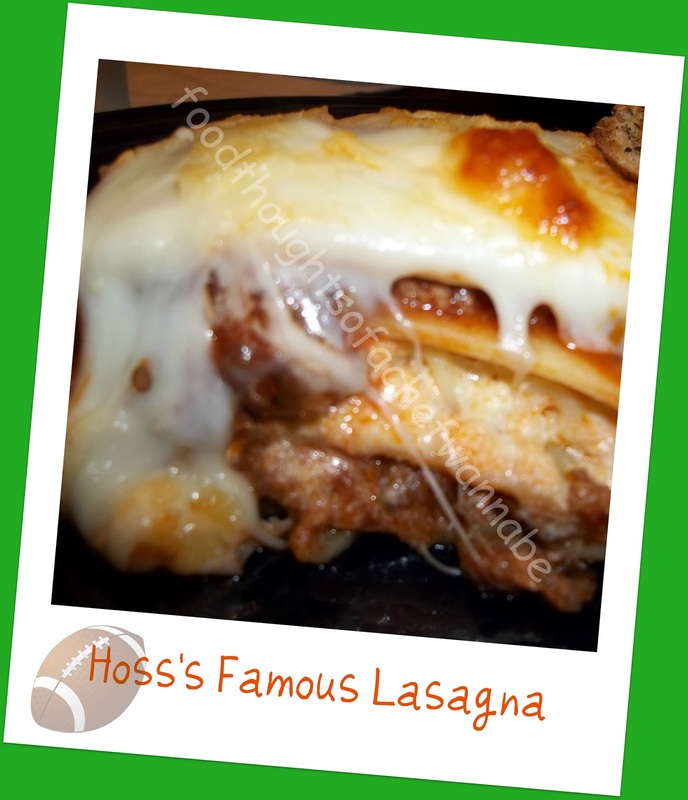 Thank you honey for making lasagna for my blog. You are my best friend and my coolest buddy ever! This is not cheap to make but when you consider the amount of food you get, it really works out. You can also make 3- 9x13's. Great from the freezer! Let thaw in the fridge overnight and pop in the oven for dinner! We just served it with the usual suspects, salad and crusty bread! Geo, you are a ham!!! 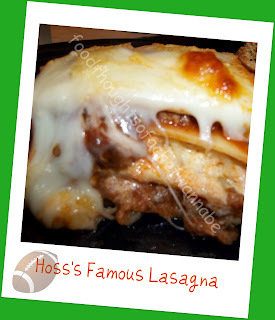 Great blog and I'm thinking that is some darn good lasagna!!! He says, "It IS beyond darn good, it is HOSSTACULAR, or GEOTASTIC". Oh my, don't get him going!!!! He says it is even better the next day! This looks so awesome I can't wait to have a minute in my life, that is totally nuts right now, to try this! Hey Hoss, I got a real kick out of this blog that you and your wife did together. I know you guys had a fun time and many good laughs and memories were made.I have no problem with a good jarred sauce. I don't know what a box of Pomi tomatoes are. Would a 28 oz. can of crushed tomatoes work? The next time I have to make a lot of food for a party, event. etc. I will be making your recipe for lasagne. I can see red sauce all over me by the time I am done but I have fun cooking so it's no big deal. Thanks again for this lovely and heart warming blog. Bon Appe'tite. Yes it will work. Thank you for your kind comments. My wife and I love cooking together. Cooking should be fun, let the sauce fly! Thanks for reading my wifes blog! Thank you! He sure is special! So glad to have you! this is def. on my food bucket list! Great job Hoss!